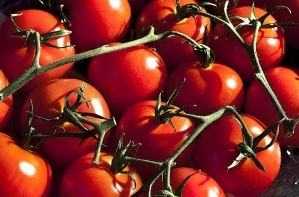 Summary: Here are 10 health reasons to eat more tomatoes. (NaturalNews) Did yo know that tomatoes are the most popular vegetable grown in the world? They are hardy summer plants that give a high yield when taken care of properly. Tomatoes are loaded with many health benefits and life enhancing properties. They are a rich source of vitamins A and C and folic acid. Tomatoes contain a wide array of beneficial nutrients and antioxidants, including alpha-lipoic acid, lycopene, choline, folic acid, beta-carotene and lutein. Here are ten benefits of why you might want to start adding more tomatoes to your diet. Tomatoes are high in lycopene. The lycopene and antioxidants helps protect the skin from UV light damage while keeping signs of aging at bay. Tomatoes have high levels of calcium and vitamin K which are both good for repairing and strengthening bones. Lycopene has been shown to improve bone mass which makes it a good food for fighting osteoporosis. A number of studies have been done now finding that tomatoes with their high levels of lycopene reduces the chances of getting different cancers such as breast cancer, lung cancer, prostate and stomach cancers. Lycopene is a natural antioxidant that works to slow the rate of growth of cancerous cells. Cancer occurs when there is oxidative stress and inflammation. Tomatoes proved the body with antioxidants and anti-inflammatory support. Adding tomatoes to your diet should not only help you sleep better, Getting better sleep will also improve all areas of your life. Tomatoes are high in vitamin A which is also important for good vision. They are low in calories, dense with nutrients and high in energy. They are high in water content so they help curb your appetite. Tomatoes also helps with constipation with their high fiber and water content. Studies have shown that prostate tumors grew much more slowly in rats that were fed tomatoes. Tomatoes are good for hearth health. They are effective and reducing cholesterol levels and lower blood pressure with their high levels of vitamin B, folate, niacin and potassium. Including tomatoes in the diet lowers the risk of heart attacks and other heart problems. Tomatoes can reduce the damage caused by smoking. Tomatoes contain coumaric acid and chlorogenic acid that work to protect the body from carcinogens that are produced from cigarette smoke. Tomatoes are an excellent source of vitamin C which helps to boost the immune system.